ATTENTION NHJH STUDENTS AND PARENTS! READ THIS FOR IMPORTANT INFORMATION IN REGARD TO MR. MILLER'S FRESHMAN BIOLOGY CLASSES. NHJH FRESHMAN: Click on this text to go to the Seaman High School website and learn about the school you will be attending next year. Read about the classes, instructors, and requirements at this excellent website. Many of the instructors have their own websites that provide a lot of excellent information about them and their classes. Please note that all NHJH freshman biology students were given several documents at the first of the school year to help them plan for a smooth and productive educational experience. Those documents included a list of the chapters in the biology textbook that are scheduled to be covered during the school year, Detailed information (including important deadlines) in regard to the required Earth Day and Earth Fair projects, detailed information in regard to keeping an organized biology notebook, and guidelines dealing with what is expected from students when they are in biology class. Students are also encouraged to keep their school planners updated and to go over upcoming assignments with their parents. Parents are encouraged to spend time discussing upcoming assignments with their children. Good communications between students, their parents, and teachers is extremely important. NHJH operates on RESPECT, EFFORT, and RESPONSIBILITY. Below you will find a few select websites. Please note that there are many excellent links to educational websites at the "suggested websites" link at the top of this page. 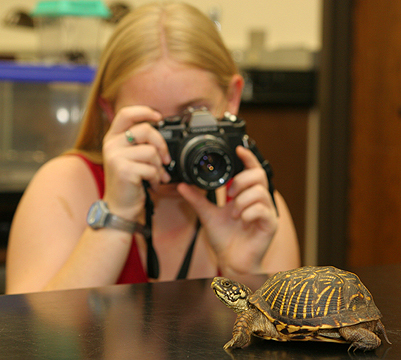 Dr. Guntram Deichsel, a herpetologist from Germany, visited with NHJH biology students on Monday, 4 October 2004. Click on this text to learn more about his interests and the ALIEN LIZARDS OF TOPEKA. Click here to go to a special page with links to a variety of NHJH science related photos. A GUIDE TO GREAT SNAKES OF KANSAS is a pocket field guide that was funded in part by the "Green Team" at Westar Energy. All freshman biology students at NHJH received a copy of the field guide on 30 August 2005. Click here for the "Green Team" website. * Follow some of the links from this site and related sites to view a variety of photos dealing with NHJH students and their activities. Note that some of the photographs at some of the sites are links to other scientific and educational websites. ORNATE BOX TURTLE as a Kansas icon! Counters are reset on a regular basis.